AD1 Global is a leading hospitality group with 15 properties under management and six more in development in the Southeast U.S. AD1 Global growth has been fueled by its strategy of acquiring and renovating existing hotels, with an eye towards becoming the best and most profitable hotel company in the universe. AD1 Global has been expanding and acquiring new properties, and together with ONPEAK Energy has designed a strategy to be more sustainable and help with the reduction in emissions by implementing some changes to the assets they manage. For Comfort Inn International Drive, at Orlando Florida, ONPEAK Energy proposed an LED retrofit for all the common areas of the hotel. ONPEAK Energy is a Florida-based Efficiency Consultancy Company that works with building owners to evaluate, install, and help finance investments in energy-saving equipment. For Comfort Inn, after assessing the property, ONPEAK proposed a complete upgrade of the lighting system located in the common areas, including indoor and outdoor lights, with high efficiency LED systems including new fixtures and new lamps, keeping the hotel’s design and standards. Since all common area lights must be on 24 / 7, reducing their electricity consumption by replacing them with new LED ones generated significant energy and maintenance savings. By replacing over six hundred old lights with LED lamps and fixtures, the property saves over to 81,000 kWh per year, that represents over $8,000 per year in energy savings, in addition since the LED lights are designed to work more hours and the old lights, the property will achieve over to $2,000 in maintenance savings per year. With the retrofit presented by ONPEAK, Comfort Inn International Drive will save over $10,000 per year, with a payback close to two years. To avoid a negative impact in the cash flow, ONPEAK offered a technology subscription model, with this structure the Hotel has no operational risk, the monthly payment is below the savings generated by the new equipment and 100% of the payment is an operating expense. 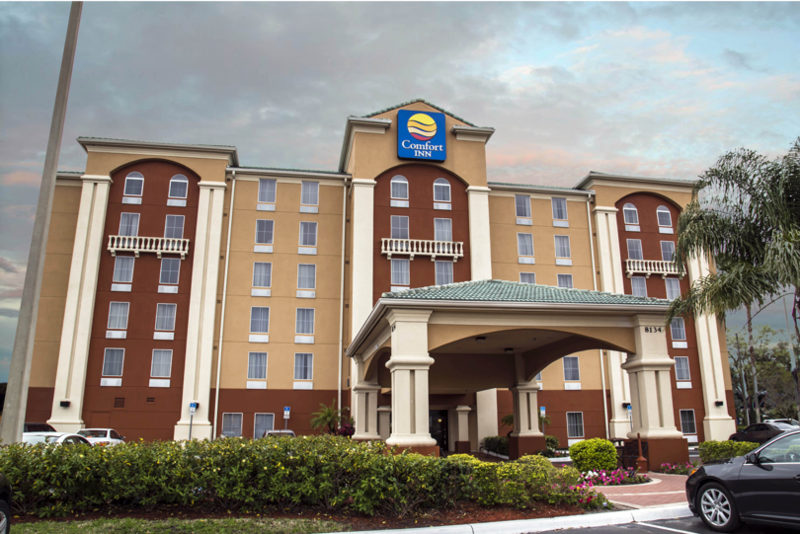 With the new lighting system, Comfort Inn International Drive achieved over to $10,000 in annual savings. The project gets repaid by savings created, the Hotel improved its look and 100% of the payment became OPEX instead of CAPEX. The quality of the light at the property was improved, keeping the internal design and the brand’s standard. For AD1 and Comfort Inn International Drive, upgrading their common areas lights to LED was a safe play and a risk-free project.